Industrial Strength Odor Control - in a Personal Size! ONA Odor Neutralizer - Now in a Handy Spray Bottle! ONA Spray - Use it Everywhere! Do you have smokers in your family? Do you have pets that go everywhere in your house? Do you have an unpleasant garbage area? Would you like the air in your home or office to smell fresh and clean? Then use the ONA Spray! ONA Spray comes in a convenient 250 ml (8 oz) bottle, and it is all you will ever need. It is a true odor neutralizer, unlike some store brands that just scent the air. Would you like the air in your home or office to smell wonderful? Then use Ona Spray - Apple Crumble. 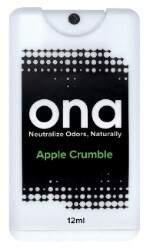 This new scent from Ona leaves behind a delicious apple aroma to help freshen up any room. Apple Crumble - So good you have to try it!